How Will FDA’s new precisionFDA Science 2.0 Collaboration Platform Protect Data? Imagine a world where doctors have at their fingertips the information that allows them to individualize a diagnosis, treatment or even a cure for a person based on their genes. That’s what President Obama envisioned when he announced his Precision Medicine Initiative earlier this year. Today, with the launch of FDA’s precisionFDA web platform, we’re a step closer to achieving that vision. PrecisionFDA is an online, cloud-based, portal that will allow scientists from industry, academia, government and other partners to come together to foster innovation and develop the science behind a method of “reading” DNA known as next-generation sequencing (or NGS). Next Generation Sequencing allows scientists to compile a vast amount of data on a person’s exact order or sequence of DNA. Recognizing that each person’s DNA is slightly different, scientists can look for meaningful differences in DNA that can be used to suggest a person’s risk of disease, possible response to treatment and assess their current state of health. Ultimately, what we learn about these differences could be used to design a treatment tailored to a specific individual. The precisionFDA platform is a part of this larger effort and through its use we want to help scientists work toward the most accurate and meaningful discoveries. precisionFDA users will have access to a number of important tools to help them do this. These tools include reference genomes, such as “Genome in the Bottle,” a reference sample of DNA for validating human genome sequences developed by the National Institute of Standards and Technology. Users will also be able to compare their results to previously validated reference results as well as share their results with other users, track changes and obtain feedback. Over the coming months we will engage users in improving the usability, openness and transparency of precisionFDA. One way we’ll achieve that is by placing the code for the precisionFDA portal on the world’s largest open source software repository, GitHub, so the community can further enhance precisionFDA’s features.Through such collaboration we hope to improve the quality and accuracy of genomic tests – work that will ultimately benefit patients. precisionFDA leverages our experience establishing openFDA, an online community that provides easy access to our public datasets. 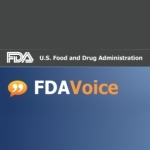 Since its launch in 2014, openFDA has already resulted in many novel ways to use, integrate and analyze FDA safety information. We’re confident that employing such a collaborative approach to DNA data will yield important advances in our understanding of this fast-growing scientific field, information that will ultimately be used to develop new diagnostics, treatments and even cures for patients. 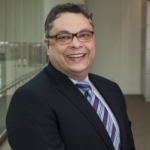 Taha A. Kass-Hout, M.D., M.S., is FDA’s Chief Health Informatics Officer and Director of FDA’s Office of Health Informatics. 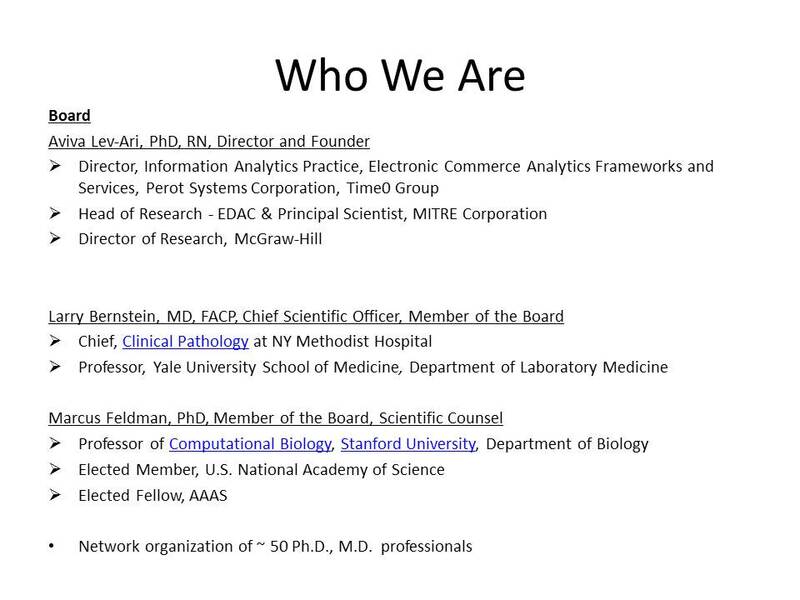 Elaine Johanson is the precisionFDA Project Manager. The opinions expressed in this blog post are the author’s only and do not necessarily reflect those of MassDevice.com or its employees. 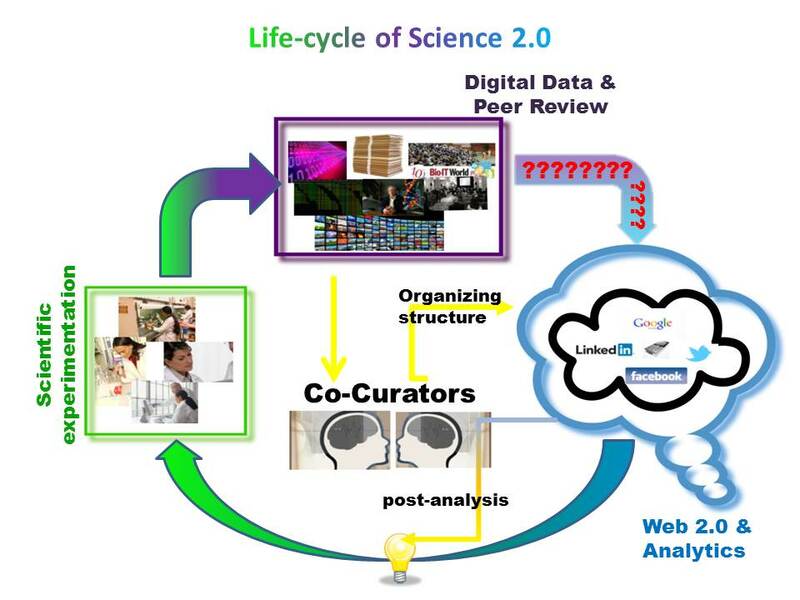 So What Are the Other Successes With Such Open Science 2.0 Collaborative Networks? exists these networks can flourish and add interesting discourse. Scientists are already relying on these networks to collaborate and share however resistance by certain members of an “elite” can still exist. 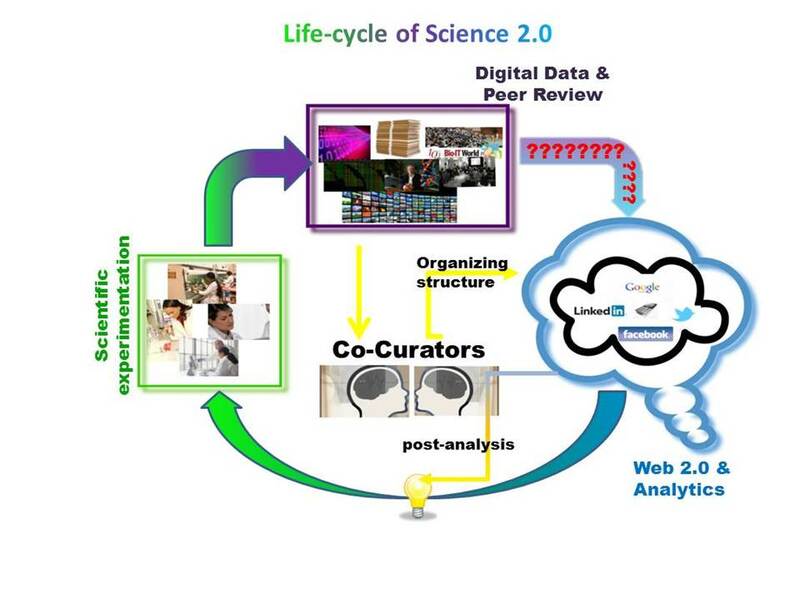 Social media platforms are now democratizing this new science2.0 effort. In addition the efforts of multiple biocurators (who mainly work for love of science) have organized the plethora of data (both genomic, proteomic, and literature) in order to provide ease of access and analysis. The web 2.0 gave birth to new practices motivated by the will to have broader and faster cooperation in a more free and transparent environment. We have entered the era of an “open” movement: “open data”, “open software”, etc. In science, expressions like “open access” (to scientific publications and research results) and “open science” are used more and more often. Another area, where there are most likely fewer barriers, is scientific and technical culture. This broad term involves different actors such as associations, companies, universities’ communication departments, CCSTI (French centers for scientific, technical and industrial culture), journalists, etc. A number of these actors do not limit their work to popularizing the scientific data; they also consider they have an authentic mission of “culturing” science. The curation practice thus offers a better organization and visibility to the information. The sought-after benefits will be different from one actor to the next. which has created a need for more context-driven scientific search and discourse. a systematic distortion of the analytical process, which results in a misrepresentation of the data with consequential errors of inference (e.g., inferential bias). This post highlights many important points related to bias but in summarry there can be methodologies and protocols devised to eliminate such bias. Risk of bias can seriously adulterate the internal and the external validity of a clinical study, and, unless it is identified and systematically evaluated, can seriously hamper the process of comparative effectiveness and efficacy research and analysis for practice. The Cochrane Group and the Agency for Healthcare Research and Quality have independently developed instruments for assessing the meta-construct of risk of bias. The present article begins to discuss this dialectic. So what about the safety and privacy of Data? A while back I did a post and some interviews on how doctors in developing countries are using social networks to communicate with patients, either over established networks like Facebook or more private in-house networks. In addition, these doctor-patient relationships in developing countries are remote, using the smartphone to communicate with rural patients who don’t have ready access to their physicians. Located in the post Can Mobile Health Apps Improve Oral-Chemotherapy Adherence? The Benefit of Gamification. According to International Telecommunication Union (ITU) statistics, world-wide mobile phone use has expanded tremendously in the past 5 years, reaching almost 6 billion subscriptions. By the end of this year it is estimated that over 95% of the world’s population will have access to mobile phones/devices, including smartphones. This presents a tremendous and cost-effective opportunity in developing countries, and especially rural areas, for physicians to reach patients using mHealth platforms. In Summary, although there are restrictions here in the US governing what information can be disseminated over social media networks, developing countries appear to have either defined the regulations as they are more dependent on these types of social networks given the difficulties in patient-physician access. Therefore the question will be Who Will Protect The Data? Philadelphia, PA, October 28, 2015 – Magnetic Resonance Imaging (MRI) can be a stressful experience for many people, but clinicians have few ways to track the thoughts and feelings of their patients regarding this procedure. While the social networking site Twitter is known for breaking news and celebrity tweets, it may also prove to be a valuable feedback tool for medical professionals looking to improve the patient experience, according to a new study published in the December issue of the Journal of Medical Imaging and Radiation Sciences. Johnathan Hewis, MSc, PgCert (LTHE), PgCert (BE), BSc Hon, an investigator from Charles Sturt University in Australia, analyzed 464 tweets related to MRI over the course of one month and found that patients, their friends, and family members were sharing their thoughts and feelings about all aspects of the procedure through the microblogging site. Tweets were categorized into three themes: MRI appointment, scan experience, and diagnosis. Not all the tweets were centered around stress. Many friends and family members expressed sentiments of support including prayers and offering messages of strength. Some patients used Twitter to praise their healthcare team or give thanks for good results. Others spoke about the fact they liked having an MRI because it gave them some time to themselves or offered them a chance to nap. Twitter, Google, LinkedIn Enter in the Curation Foray: What’s Up With That? Recently Twitter has announced a new feature which they hope to use to increase engagement on their platform. Originally dubbed Project Lightning and now called Moments, this feature involves many human curators which aggregate and curate tweets surrounding individual live events(which used to be under #Live). Please see more about Moments on his blog here. What’s a challenge for Google is a direct threat to Twitter’s existence. For all the talk about what doesn’t work in journalism, curation works. Following the news, collecting it and commenting, and encouraging discussion, is the “secret sauce” for companies like Buzzfeed, Vox, Vice and The Huffington Post, which often wind up getting more traffic from a story at, say The New York Times (NYSE:NYT), than the Times does as a result. Curation is, in some ways, a throwback to the pre-Internet era. It’s done by people. (At least I think I’m a people.) So as odd as it is for Twitter (NYSE:TWTR) to announce it will curate live events it’s even odder to see Google (NASDAQ:GOOG) (NASDAQ:GOOGL) doing it in a project called YouTube Newswire. Buzzfeed, Google’s content curation platform, made for desktop as well as a mobile app, allows sharing of curated news, viral videos. The feel for both Twitter and Google’s content curation will be like a newspaper, with an army of human content curators determining what is the trendiest news to read or videos to watch. BuzzFeed articles, or at least, the headlines can easily be mined from any social network but reading the whole article still requires that you open the link within the app or outside using a mobile web browser. Loading takes some time–a few seconds longer. Try browsing the BuzzFeed feed on the app and you’ll notice the obvious difference. However it was earlier this summer in a Forbes article Why Apple, Snapchat and Twitter are betting on human editors, but Facebook and Google aren’t that Apple, Snapchat and Twitter as well as LinkedIn Pulse and Instragram were going to use human editors and curators while Facebook and Google were going to rely on their powerful algorithms. Google (now Alphabet) CEO Eric Schmidt has even called Apple’s human curated playlists “elitist” although Google Play has human curated playlists. Google News: Less focused on social signals than textual ones, Google News uses its analytic tools to group together related stories and highlight the biggest ones. Unlike Techmeme, it’s entirely driven by algorithms, and that means it often makes weird choices. I’ve heard that Google uses social sharing signals from Google+ to help determine which stories appear on Google News, but have never heard definitive confirmation of that — and now that Google+ is all but dead, it’s mostly moot. I find Google News an unsatisfying home page, but it is a good place to search for news once you’ve found it. WordPress also has announced its curation plugin called Curation Traffic. “The Curation Traffic™ System is a complete WordPress based content curation solution. Giving you all the tools and strategies you need to put content curation into action. It is push-button simple and seamlessly integrates with any WordPress site or blog. The theory the more you share on your platform the more engagement the better marketing experience. And with all the WordPress users out there they have already an army of human curators. So That’s Great For News But What About Science and Medicine? The news and trendy topics such as fashion and music are common in most people’s experiences. However more technical areas of science, medicine, engineering are not in most people’s domain so aggregation of content needs a process of peer review to sort basically “the fact from fiction”. On social media this is extremely important as sensational stories of breakthroughs can spread virally without proper vetting and even influence patient decisions about their own personal care. In steps the human experience. On this site (www.pharmaceuticalintelligence.com) we attempt to do just this. A consortium of M.D.s, Ph.D. and other medical professionals spend their own time to aggregate not only topics of interest but curate on specific topics to add some more insight from acceptable sources over the web. In Power of Analogy: Curation in Music, Music Critique as a Curation and Curation of Medical Research Findings – A Comparison; Dr. Larry Berstein compares a museum or music curator to curation of scientific findings and literature and draws similar conclusions from each: that a curation can be a tool to gain new insights previously unseen an observer. A way of stepping back to see a different picture, hear a different song. and curation and analysis give rise not only to meeting engagement butunique insights into presentations. In addition, the use of a WordPress platform allows easy sharing among many different social platforms including Twitter, Google+, LinkedIn, Pinterest etc. 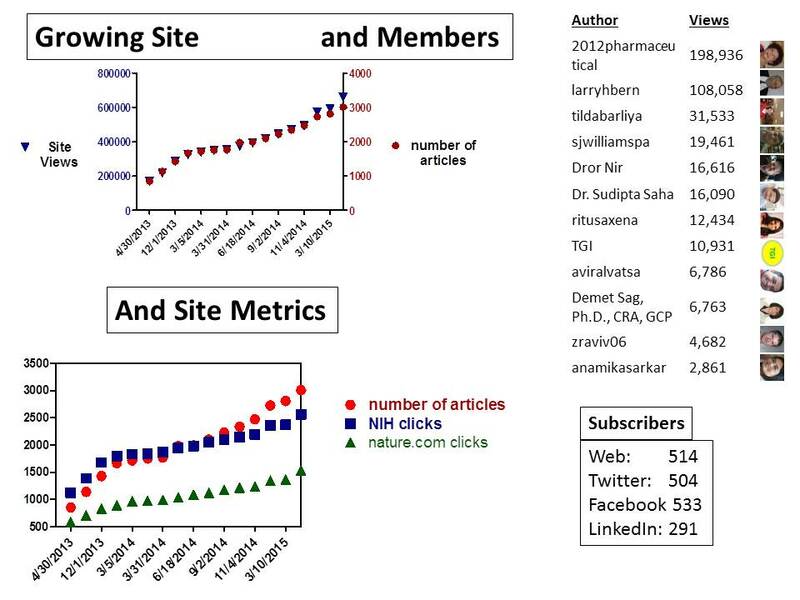 Hopefully, this will catch on to the big powers of Twitter, Google and Facebook to realize there exists armies of niche curation communities which they can draw on for expert curation in the biosciences. A recent Science article (Who are the science stars of Twitter? ; Sept. 19, 2014) reported the top 50 scientists followed on Twitter. However, the article tended to focus on the use of Twitter as a means to develop popularity, a sort of “Science Kardashian” as they coined it. So the writers at Science developed a “Kardashian Index (K-Index) to determine scientists following and popularity on Twitter. Twitter Analytics – Hashtags.org – determine most impactful # for your Tweets For example, meeting coverage of bioinvestment conferences or startup presentations using #startup generates automatic retweeting by Startup tweetbot @StartupTweetSF. In a paper entitled Twitter Use at a Family Medicine Conference: Analyzing #STFM13 authors Ranit Mishori, MD, Frendan Levy, MD, and Benjamin Donvan analyzed the public tweets from the 2013 Society of Teachers of Family Medicine (STFM) conference bearing the meeting-specific hashtag #STFM13. Thirteen percent of conference attendees (181 users) used the #STFM13 to share their thoughts on the meeting (1,818 total tweets) showing a desire for social media interaction at conferences but suggesting growth potential in this area. As we have also seen, the heaviest volume of conference-tweets originated from a small number of Twitter users however most tweets were related to session content. However, as the authors note, although it is easy to measure common metrics such as number of tweets and retweets, determining quality of engagement from tweets would be important for gauging the value of Twitter-based social-media coverage of medical conferences. Thea authors compared their results with similar analytics generated by the HealthCare Hashtag Project, a project and database of medically-related hashtag use, coordinated and maintained by the company Symplur. Symplur’s database includes medical and scientific conference Twitter coverage but also Twitter usuage related to patient care. In this case the database was used to compare meeting tweets and hashtag use with the 2012 STFM conference. 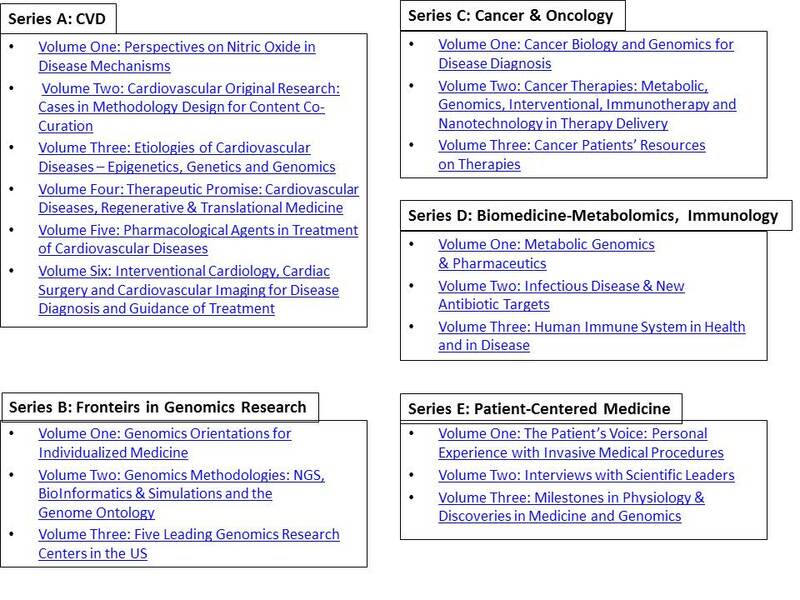 These are some of the published journal articles that have employed Symplur (www.symplur.com) data in their research of Twitter usage in medical conferences. The impact of social media on a major international emergency medicine conference. Social media in radiology: early trends in Twitter microblogging at radiology’s largest international meeting. Hawkins, C. M., Duszak, R., & Rawson, J. V. (2014). Social Media in Radiology: Early Trends in Twitter Microblogging at Radiology’s Largest International Meeting. Journal of the American College of Radiology, 11(4), 387-390.
International Urology Journal Club via Twitter: 12-Month Experience. Thangasamy, I. A., Leveridge, M., Davies, B. J., Finelli, A., Stork, B., & Woo, H. H. (2014). International Urology Journal Club via Twitter: 12-Month Experience. European urology. Use of social media in urology: data from the American Urological Association (AUA). Loeb, S., Bayne, C. E., Frey, C., Davies, B. J., Averch, T. D., Woo, H. H., … & Eggener, S. E. (2014). Use of social media in urology: data from the American Urological Association (AUA). BJU international, 113(6), 993-998. Chicago. Social media: A tool to spread information: A case study analysis of Twitter conversation at the Cardiac Society of Australia & New Zealand 61st Annual Scientific Meeting 2013. Ferguson, C., Inglis, S. C., Newton, P. J., Cripps, P. J., Macdonald, P. S., & Davidson, P. M. (2014). Social media: A tool to spread information: A case study analysis of Twitter conversation at the Cardiac Society of Australia & New Zealand 61st Annual Scientific Meeting 2013. Collegian. 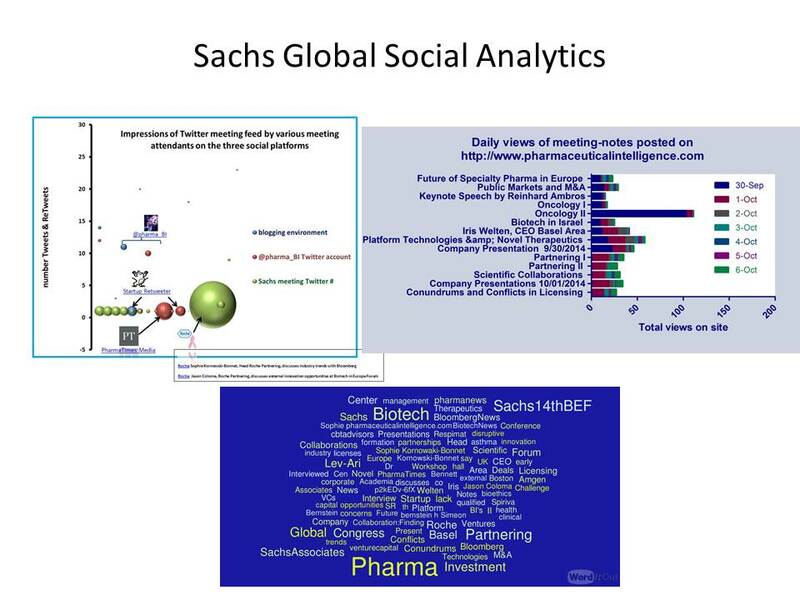 Here, at Leaders in Pharmaceutical Business Intelligence (LBPI) we have integrated our web site, Twitter handle (@pharma_BI), and meeting specific hashtags, with a unique methodology, to monitor and measure meeting participant engagement for various international meetings (please see our Press Coverage section of our site for more information). 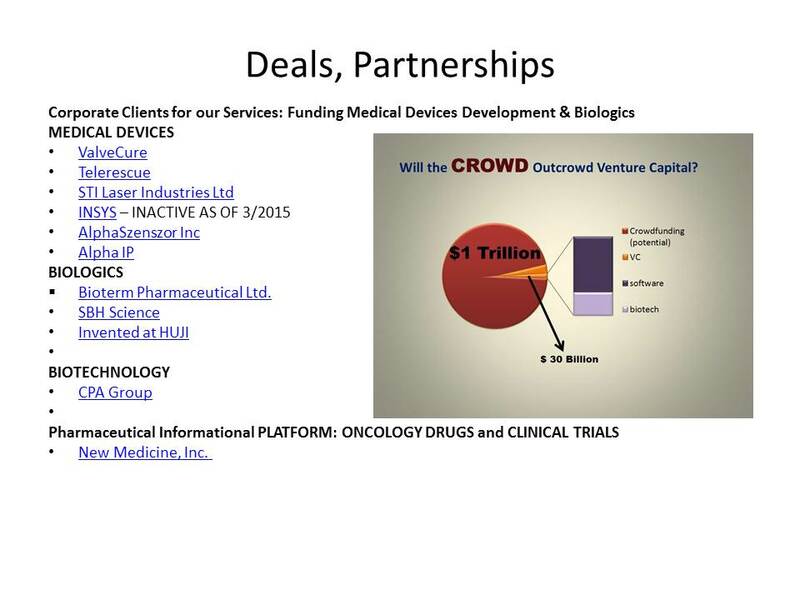 These meetings included the 2nd Annual Sachs Associates Cancer BioInvestment & Partnering Forum and the 14th Annual Sachs Associates Global Forum. Although the desire of patients to use and interact with their physicians over social media is increasing, along with increasing health-related social media platforms and applications, there are certain obstacles to patient-health provider social media interaction, including lack of regulatory framework as well as database and security issues. Some of the successes and issues of social media and healthcare are discussed in the post Can Mobile Health Apps Improve Oral-Chemotherapy Adherence? The Benefit of Gamification. However there is also a concern if social media truly engages the patient and improves patient education. In a study of Twitter communications by breast cancer patients Tweeting about breast cancer, authors noticed Tweeting was a singular event. The majority of tweets did not promote any specific preventive behavior. The authors concluded “Twitter is being used mostly as a one-way communication tool.” (Using Twitter for breast cancer prevention: an analysis of breast cancer awareness month. Thackeray R1, Burton SH, Giraud-Carrier C, Rollins S, Draper CR. BMC Cancer. 2013;13:508). In addition a new poll by Harris Interactive and HealthDay shows one third of patients want some mobile interaction with their physicians. e-Patients in Twitter Hashtag Communities. Nurses and Twitter: The good, the bad, and the reluctant. Wilson, R., Ranse, J., Cashin, A., & McNamara, P. (2013). Nurses and Twitter: The good, the bad, and the reluctant. Collegian. Chicago. Using social media for continuous professional development. Moorley, C., & Chinn, T. (2014). Using social media for continuous professional development. Journal of advanced nursing. Networking opportunities for learning disability nurses. Abdulla, S., Marsden, D., Wilson, S., & Parker, M. (2013). Networking opportunities for learning disability nurses: Samuel Abdulla and colleagues explain why social media offer professionals new opportunities for information sharing, discussion and peer support. Learning Disability Practice, 16(5), 30-32. Using Twitter for professional knowledge. Kraft, M. A. (2013). Using Twitter for professional knowledge. Journal of the European Association for Health Information and Libraries, 9(4), 10. A Study on the Influence of Semantics on the Analysis of Micro-blog Tags in the Medical Domain. Vicient, C., & Moreno, A. (2013). A Study on the Influence of Semantics on the Analysis of Micro-blog Tags in the Medical Domain. In Availability, Reliability, and Security in Information Systems and HCI (pp. 446-459). Springer Berlin Heidelberg. Twitter for Public Health: An Open-source Data Solution. Nghiema, S., Mehtab, P., & Taoc, L. Twitter for Public Health: An Open-source Data Solution. Chicago. Pharmacovigilance is the systematic detection, reporting, collecting, and monitoring of adverse events pre- and post-market of a therapeutic intervention (drug, device, modality e.g.). 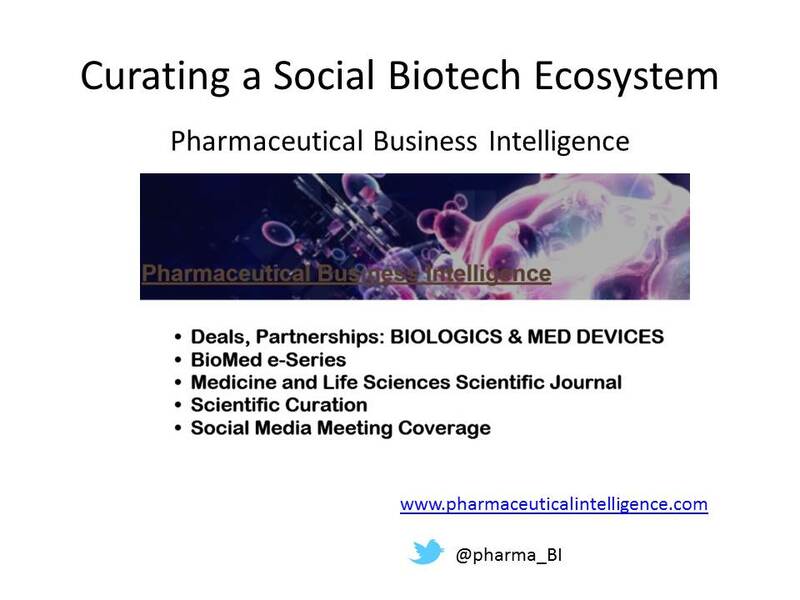 In a Cutting Edge Information Study, 56% of pharma companies databases are an adverse event channel and more companies are turning to social media to track adverse events (in Pharmacovigilance Teams Turn to Technology for Adverse Event Reporting Needs). In addition there have been many reports (see Digital Drug Safety Surveillance: Monitoring Pharmaceutical Products in Twitter) that show patients are frequently tweeting about their adverse events. There have been concerns with using Twitter and social media to monitor for adverse events. For example FDA funded a study where a team of researchers from Harvard Medical School and other academic centers examined more than 60,000 tweets, of which 4,401 were manually categorized as resembling adverse events and compared with the FDA pharmacovigilance databases. Problems associated with such social media strategy were inability to obtain extra, needed information from patients and difficulty in separating the relevant Tweets from irrelevant chatter. The UK has launched a similar program called WEB-RADR to determine if monitoring #drug_reaction could be useful for monitoring adverse events. Many researchers have found the adverse-event related tweets “noisy” due to varied language but had noticed many people do understand some principles of causation including when adverse event subsides after discontinuing the drug. However Dr. Clark Freifeld, Ph.D., from Boston University and founder of the startup Epidemico, feels his company has the algorithms that can separate out the true adverse events from the junk. According to their web site, their algorithm has high accuracy when compared to the FDA database. Dr. Freifeld admits that Twitter use for pharmacovigilance purposes is probably a starting point for further follow-up, as each patient needs to fill out the four-page forms required for data entry into the FDA database. How to store, process, analyze and make sense of Big Data is of increasing interest and importance to technology companies, a wide range of industries, and academic institutions. In this course, UC Berkeley professors and Twitter engineers will lecture on the most cutting-edge algorithms and software tools for data analytics as applied to Twitter microblog data. Topics will include applied natural language processing algorithms such as sentiment analysis, large scale anomaly detection, real-time search, information diffusion and outbreak detection, trend detection in social streams, recommendation algorithms, and advanced frameworks for distributed computing. 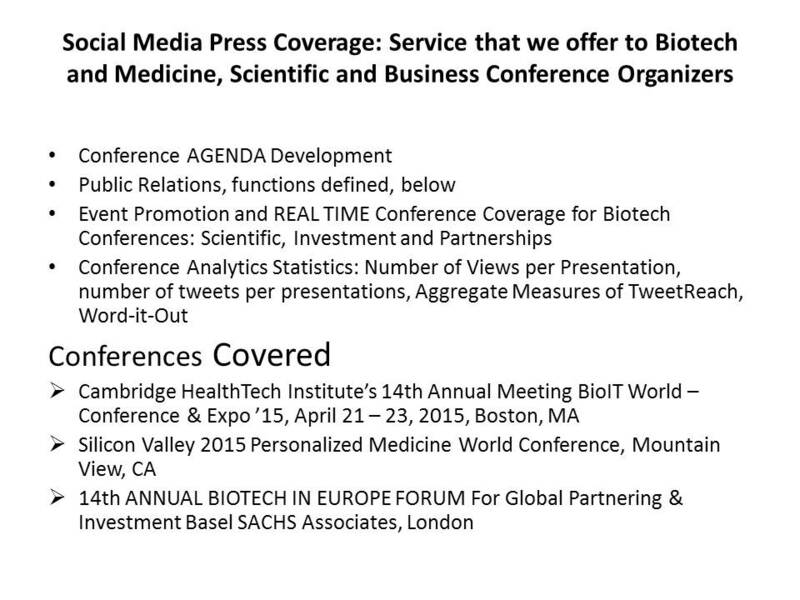 Social science perspectives on analyzing social media will also be covered. This is a hands-on project course in which students are expected to form teams to complete intensive programming and analytics projects using the real-world example of Twitter data and code bases. Engineers from Twitter will help advise student projects, and students will have the option of presenting their final project presentations to an audience of engineers at the headquarters of Twitter in San Francisco (in addition to on campus). Project topics include building on existing infrastructure tools, building Twitter apps, and analyzing Twitter data. Access to data will be provided. Can Mobile Health Apps Improve Oral-Chemotherapy Adherence? The Benefit of Gamification. Which one is right for which new companies at which stage of the funding process? And how will choosing the right or wrong one influence follow-on funders and funding rounds? Will the advent of crowdfunding speed up the investment process? Will it really bridge the yawning “valley of death”? The panel is made up of notables and practitioners who will be called upon to deal with the pros and cons of crowdfunding in real life and let them discuss how all this is likely to apply to life science entrepreneurs and investors. 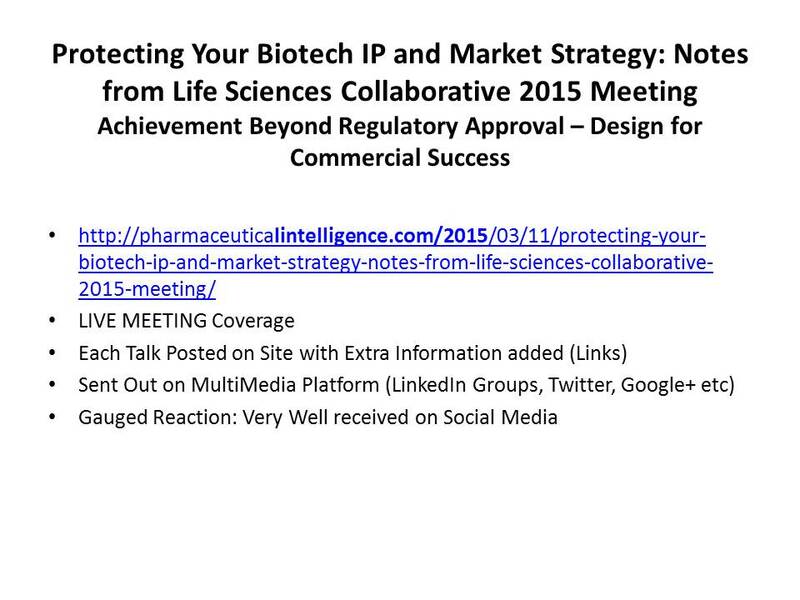 Register by clicking on www.rxpcci.com and following directions The event will be webcast. 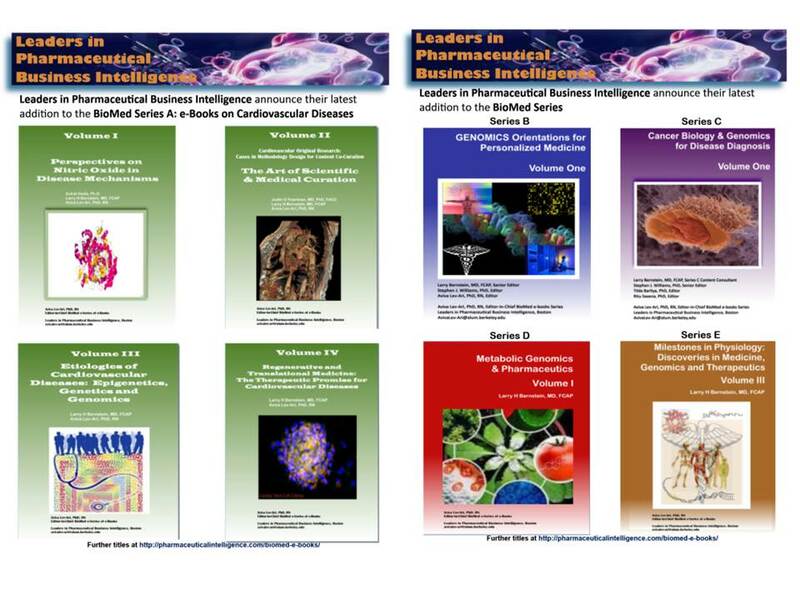 Leaders in Pharmaceutical Business Intelligence had recently launched a new, real-time based methodology for meeting coverage using social media as a platform to foster discussion and commentary. 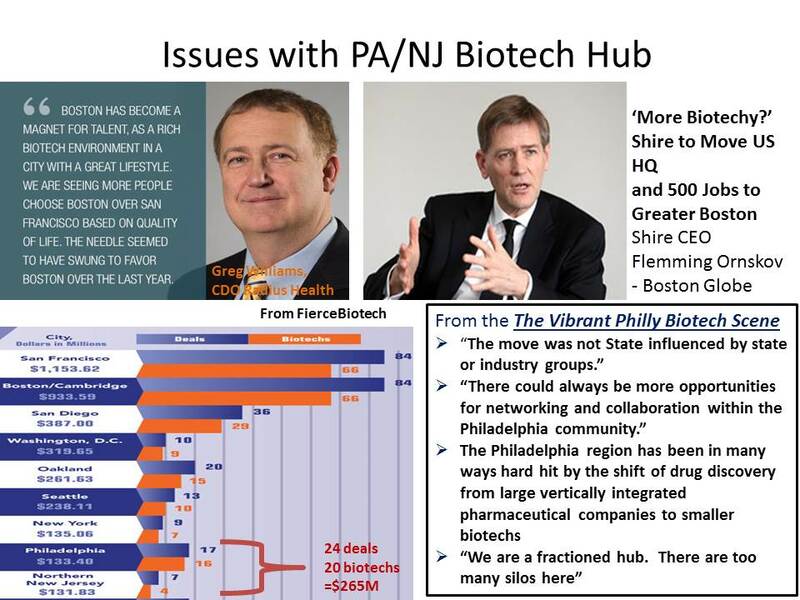 This new method was successfully used and curated at the 2nd Annual Sachs Cancer Bio Partnering &Investment Forum at the New York Academy of Sciences and will be featured at the forthcoming Sachs Global Conferences in 2014 and 2015. Volatile Organic Compounds (VOCs) as Biomarkers in Cancer Detection: • Alnion Ranked #1 in “Top 10 Israeli medical advances to watch in 2014”.